This thread is so Members can share images of Duffy The Disney Bear. Feel free to post photo's of your very own Duffy collection and your Duffy out enjoying day trips to the Disney Parks and other locations. 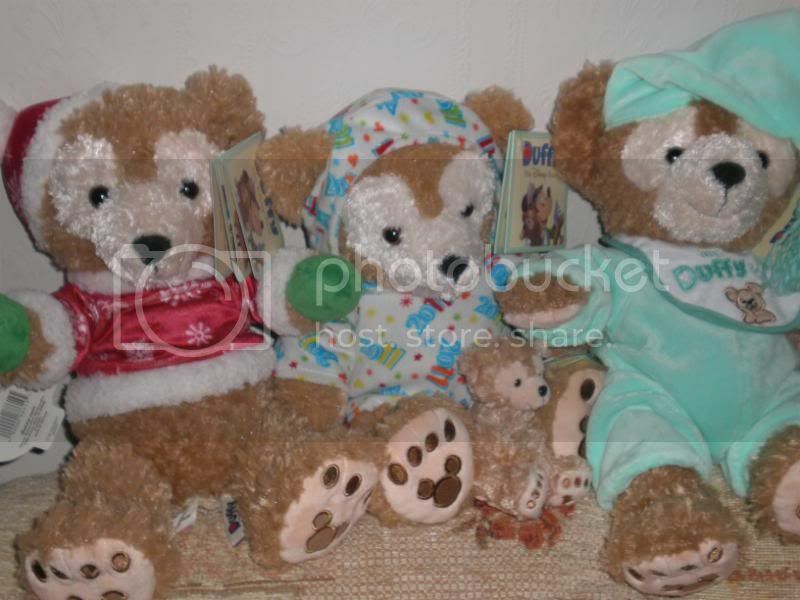 Here are a few pictures of my Duffy collection at home. 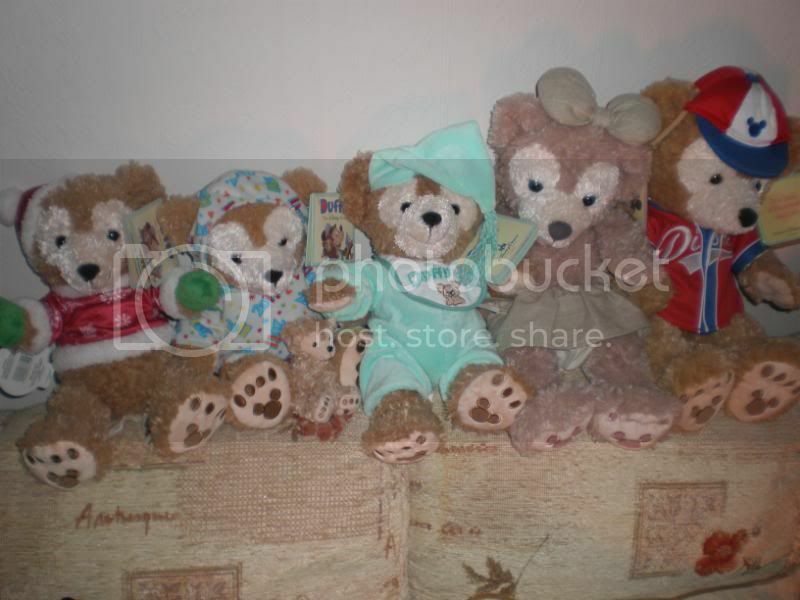 The Duffy Bears were purchased at both the Tokyo Disney Resort and Walt Disney World. That baseball outfit is cute. Do they sell that at Disneyland CA or is that a Tokyo exclusive? These pics were from October 17th. The day I got Duffy. I made a TR based on Duffy so these are from that TR. The first photo with Duffy. After I bought the 17 inch Duffy with the Sailor outfit. Of course I brought him out to see Mickey. And my personal favorite, Duffy with Maynard. Nice pictures. LOVE the Maynard shot. 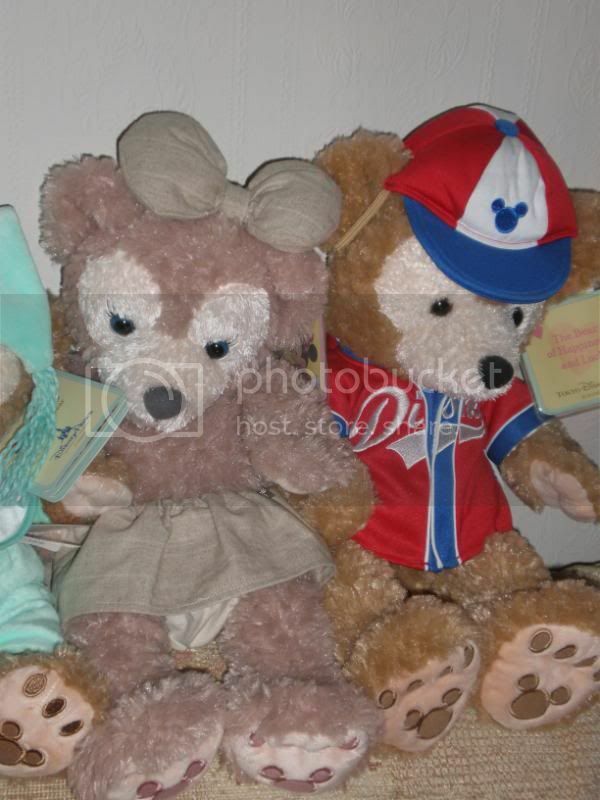 I haven't even gotten my Duffy but I'm going to get one either tomorrow or in February. He looks like fun. Do you take him to the parks whenever you go? I actually haven't brought him back to the parks since then. The last time I brought him out was when I went to the tree lighting ceremony at The Grove but I forgot to bring him out of the car and forgot my camera in the process. If there will be a Micechat Duffy Meet soon, thats when I'll bring him back to DLR with me. The Baseball costume was picked up for me from Walt Disney World. So I think its safe to say you should have no problem picking one up from Disney California Adventure providing the item hasn't sold out already. Oh and Forbidden Eye perfect example of the sort of images we are looking for here in this thread. Thanks for sharing. I just realized that unless you read Japanese, you might not notice that "ダッフィーのフォトスポット" means "Duffy's Photo Spot," so you guys may not have seen all the different photo contest winners on the official site. Some of them are really good! Check it out HERE! The link above is to the latest entry (#8) as of this posting. Use the drop-down menu to the top or bottom right to catch up on the earlier photos. A very charming Christmas pic. It really shows off the value of installing the armature. One of my favorite MiceChatter's birthday - and our Funderful Club Member Party! Ooo! Inside one of the cases at Journey to the Center of the Earth! Too bad this is "pre-armature," though! The first Sweet Duffy event in 2009! I have no photos of 2010, cos I spent the entire day in a product line until it was time to leave the park...yes...seriously. I wonder if the cafe decorations will change to pink and brown this year? I hope so! Look at all the "Duffy face" marks for Tanabata!!! And the Duffy face on top of the cake for Funderful Member's Party! If I'm not mistaken, these are the two Duffys adopted by Janell! This one, though, will always be my favorite. I am so thankful I thought to get my friend to shoot this one - my first day ever in a Disney park, the first day I saw (and took home) Duffy. It's so nice to have a photograph that actually captures the way I feel about this character - his timeless and classic nature, as well as the innocence and wonder he inspires in my heart. Love all the pictures! I remember all of those, DuffyDaisuki...well, except for the ones adopted by Janell. Gurgi, these are so completely awesome, I drooled a li'l bit!!! You didn't even have the parks as backdrop - nor armature - and showed me right up! And this is just about the cutest thing I've ever seen in my life! :blush: Notice that he's sporting official Tokyo plush candy. Oh yeah, we see how you roll, Travis! Last edited by DuffyDaisuki; 01-05-2011, 04:38 AM. I love all the pictures, Duffy Daisuki you have some of the cutest ones! My roommate had never seen the "smiling Duffy" until yesterday when I showed him your pictures. He of course wants him now, but alas I know they are not available! Yep, Duffy Daisuki that those are the Duffys I got though your adoption agency. lol I have that photo in my Duffy photo album. All the photos are so cute. Thank you all for sharing. I need to post some and will do so in a few days. I took some while at DLR over the weekend that I think you will enjoy. Duffy had a great time. My dad and husband even got into the fun of posing Duffy. They would give him forks if we were eating, put the menu in front of Duffy so he could order. It was cute. One thing I haven't found at DCA is the photo spots. I though DCA was to get the photo spots like or some what like TDS has. Where you can set your Duffy and he can pose. Maybe Im wrong. But i didn't see any this past weekend. Duffy Daisuki, I love the photo of you seeing Duffy on your first trip. It really does capture the joy Duffy brings. No, we don't have Duffy photospots, but I hope they put some in soon! That would be so cute! …I need to post some and will do so in a few days. I took some while at DLR over the weekend that I think you will enjoy. Duffy had a great time. My dad and husband even got into the fun of posing Duffy. They would give him forks if we were eating, put the menu in front of Duffy so he could order. It was cute. I love the way you can talk about posing Duffy and taking photos and you just sound so natural and cool. I always somehow get super intense and end up sounding crazy! And a great way to increase exposure! Last edited by DuffyDaisuki; 01-05-2011, 04:52 AM. I thought they were planning on adding the photo spots for Duffy at EPCOT and DCA? At least that's what they said during the launch. Along with the popcorn buckets, balloons, and ear hats. I hope that stuff is still coming. Ive got photos! Well if they load. lol Im still not great with all this sort of thing. I don't think you sound crazy. Duffy is just part of our family, like the two Westie Dogs we have. So I talk about them the same way I would my dad and husband. Duffy has brought me a lot of comfort during the hard times in life. So he is supper special. Which is what Disney is all about, well it has been for me through out my life.